As usual, spring time, inspiration time. I bought some asparagus and decided to do a risotto with it. Clean the asparagus, cut of the bottom (roughly 3 cm) and peel the lower part of them. Keep 6 aside and cut the rest in 2 cm long pieces and put the tips aside. Bring a vegetable stock to boil (1 liter). Add the chopped asparagus and let boil for 5 minutes. Then add the tips for another 5 minutes. Take the asparagus out and put aside. Put some oil in a Casserole and then the chopped onion. When golden add the rice. When it start to get shiny add the wine. When the liquid has been absorbed add some broth regularly. In the meantime I grilled the 6 asparagus I put aside with olive oil and salt. Put the salmon in a rub of spices until all sides are covered. Add the “precooked” asparagus to the rice and season with black pepper. Let cook for another 5 minutes. Pan fry the salmon on each side but try to keep a “raw” heart. Switch off the heat below the risotto, mix the gorgonzola until melted. 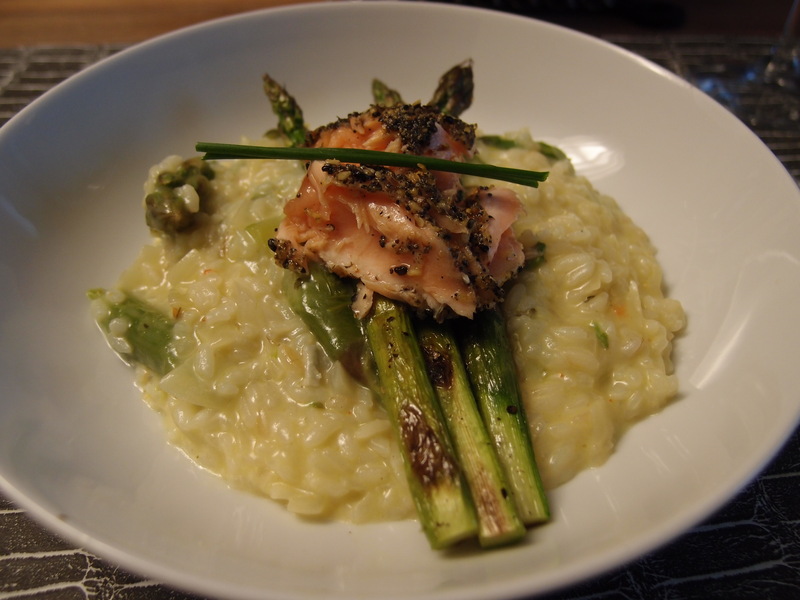 Now serve some risotto, add some grilled asparagus and some slices of salmon on the top.